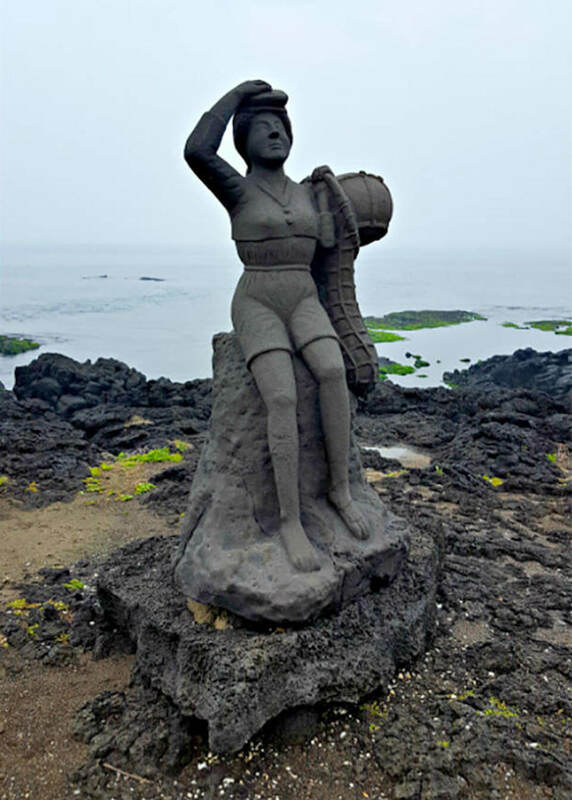 Visitors to Jeju Island, which is located to the south of Korea’s mainland, can’t fail to notice the island’s many statues of women divers. 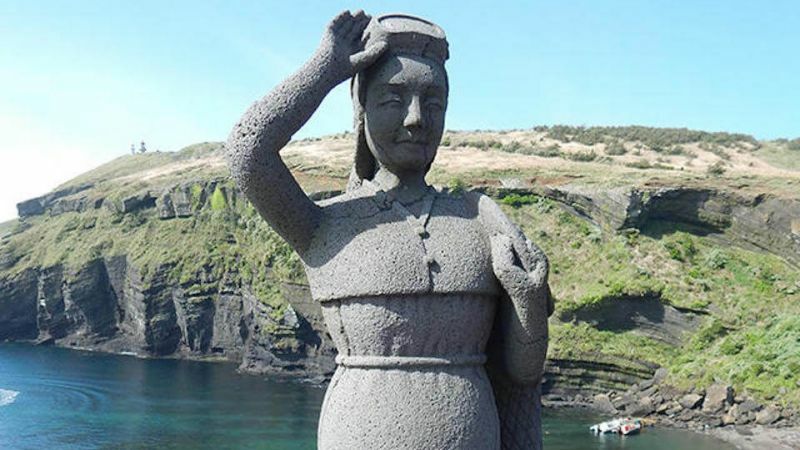 Placed in city centers or perched overlooking the island’s volcanic rock cliffs, the statues usually portray the divers, known as the haenyeo, in their traditional two-piece cloth diving clothes—but occasionally, they’re shown as mermaids with fish tails. For hundreds—perhaps thousands—of years, the women known as the haenyeo have harvested abalone, octopuses, sea cucumbers, and conches from the blue-green waters surrounding Jeju Island and the smaller Udo Island. They have always done so without sophisticated breathing equipment, reaching depths of more than 30 feet wearing only rubber suits, flippers, and goggles. They practice a form of free diving that focuses on short yet dangerous dives of only a few minutes each, and are adept at controlling their breathing, fighting the impulse to breathe in when underwater, since that might mean death. Their dangerous efforts, which often provide their family’s main source of income, have made them the symbol of Jeju Island. No one is sure how the haenyeo of Jeju Island, sometimes called the sea women, became their families’ primary breadwinners. They’ve long been something of an anomaly in Korea’s culture, which was historically strongly influenced by Confucian ideas of gender roles. Following those ideals, the life of a mainland woman was largely relegated to the domestic sphere and subject to the authority of first her father, then her husband, and eventually her son. That was not the case, however, for the haenyeo. Abalone shell knives and arrowheads found on Jeju Island suggest that island residents harvested the waters before recorded history. It’s impossible to know who dove for those prehistoric tools, but if men ever dove in equal numbers, eventually women came to dominate. One theory is that men went out to sea and did not return, leaving women to forage for food on an island created by volcanic eruptions and not well-suited to agriculture. The 16th century poet Im Je wrote about Jeju in his “A Brief Journey to the Southern Seas,” saying “The number of Jeju men who do not return to the island because their boats sink is some one hundred per year. 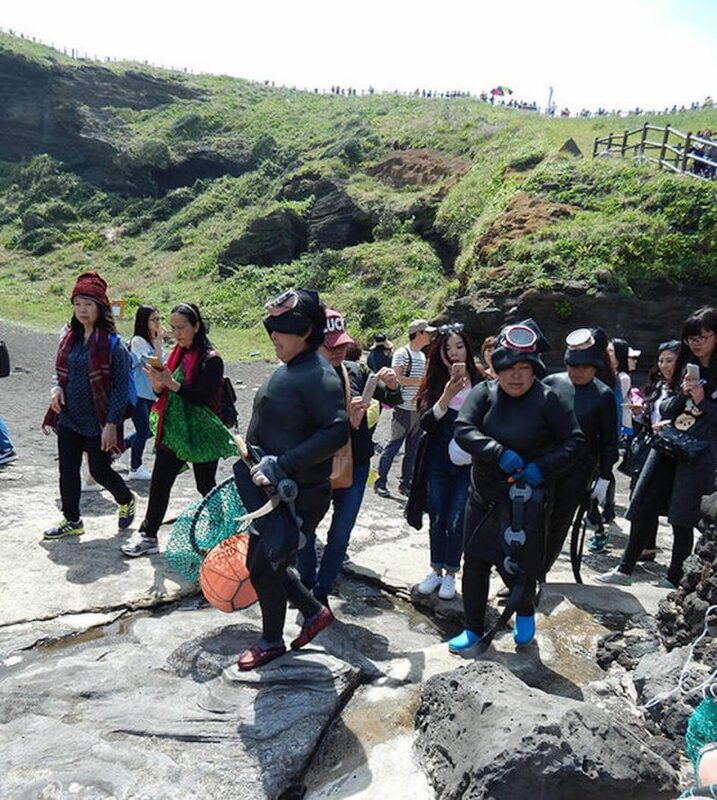 For this reason, the women are many but the men are few, and few women living in the countryside have husbands.” By the time Korean historian Lee Gun described the island’s topography in 1629, he noted only women divers. Regardless of exactly why or how it happened, at some point the island’s men took to staying home and letting their wives dive while they cared for the children. As a result, men’s families on Jeju Island paid a dowry to their prospective wives, while on the Korean mainland, women’s families traditionally provided the dowry. Another theory offered to explain why women became the primary divers is that a woman’s extra body fat may give her an edge at diving success, making her better able to withstand the cold temperatures of the waters. Although the haenyeo’s deep sea diving does require a certain aptitude—such as the ability to withstand cold water and excellent lung capacity—the women spend decades perfecting their diving skills. Traditionally, a young woman begins practicing diving skills between the age of 8 and 11, then trains for about seven years until she is considered working haenyeo. But the women aren’t considered experts at their craft until they reach their 40s, and it’s still not unusual for women to continue diving until they are in their 80s. Despite all that practice, free diving remains dangerous work. Even after a lifetime of practice, a few haenyeo die every year because they inhale water, get caught in seaweed, or encounter poisonous jellyfish or sharks. Since there’s some safety in numbers, the women tend to dive in groups. Camaraderie has shaped their community life, and they also meet to perform rituals and sing before diving. Although almost half of the island’s residents currently identify as Buddhist or Christian, some of the rituals they practice have been handed down from the island’s earliest residents, who practiced a shamanistic religion known as Muism. To this day, the haenyeo pray to village goddesses to protect them in the water. Traditionally, the women met in a circular stone ring known as a bultoek to change into their diving clothes, socialize, and make a ritual offering before entering the water. Today they are more likely to change in a conventional concrete building, but many still perform shamanistic rituals to pray for their safety. The island is currently home to hundreds of shamanic shrines, which commonly feature piles of stones. The haenyeo’s shared songs are plaintive. They sing about the risks they face and the long difficult hours they swim. Traditionally, they had to swim even when they were pregnant or had new babies. “The life of a sea woman is hard,” goes one traditional song. “To have to dive in the cold waters only days after giving birth.” The often-improvised words to their songs also deal with accepting the possibility of death when they dive. Only recently have the haenyeo earned some respect. Until the second half of the 20th century, their way of life was associated with abject poverty, and the women were looked down upon because of their work. The two-piece cloth diving costumes, called mulot, worn before the haenyeo adopted rubber diving suits, were considered unacceptably revealing. A certain amount of shame was associated with the haenyeo role, so that a child might be ashamed to say his or her mother was a sea woman. In the second half of the 20th century, the haenyeo’s accomplishments began to be seen in a different light. Korea began to recognize them as a valuable cultural asset. In 2014, the Korean government requested that UNESCO add the haenyeo to its Intangible Cultural Heritage list. The island’s Haenyeo Museum was also created to celebrate the women’s accomplishments, with exhibitions on their way of life and history. The sea women have also gained a certain celebrity after being featured in books, films, and on Korean television. 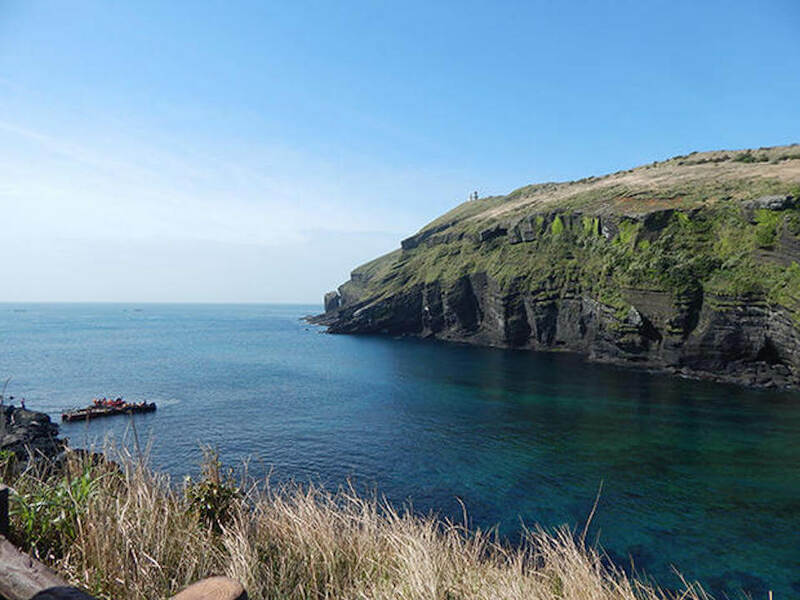 Korean TV dramas such as Warm and Cozy have both accelerated interest in haenyeo-focused tourism and helped promote opportunities to learn their skills. Yet around the same time that the haenyeo finally gained respect for their years of bravery and toil, their population began to dwindle. Their numbers have fallen from 26,000 in the 1960s to less than 5000 today, and most of the working divers are now older than 50. Diving is no longer the only option for making a living on the island, and there are many safer employment opportunities for young women, including farming (sophisticated farming equipment has now made it easier to raise citrus crops) and an ever-expanding tourist industry. 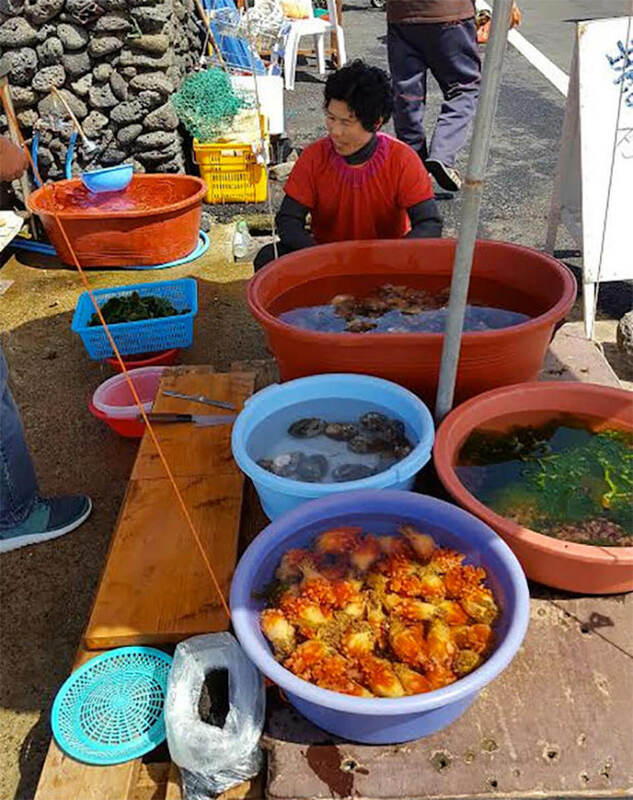 Yet the remaining haenyeo still dive and sell their catch to tourists on roadside stands on Jeju and Udo Islands. A few are happy to demonstrate their craft for tourists at sites such as Seongsan Ilchulbong, also known as Sunrise Peak, and at the island’s aquarium, Aqua Planet. But they are reluctant to discuss their way of life with those who might view them as a curiosity. Most of the haenyeo do not like to be filmed or interviewed, a relic from their days of being looked down upon. Today, it’s no longer necessary to have a haenyeo mother to learn the craft. Jeju’s Hansupul Haenyeo School has taught their skills since 2007, and due to increasing demand, a second island school will reportedly open in 2016. The Hansupul School currently accepts 70 students yearly for classes that meet from June through August. Haenyeo volunteers have taught students from the U.S., Japan, the Philippines, Australia, and Canada both diving techniques and tips on how to identify aquatic life. Upon completion of the course, students receive a certificate and can register to work at a fishing village. In an interesting reversal, some of the school’s recent students have been men. When men qualify, they are called haenim. Applicants don’t need to speak Korean to apply, nor do they need to take a test—but excellent lung capacity is a plus. While the mostly older haenyeo of Jeju Island may not look like the demure mermaids of fairy tales, they radiate a beauty born of courage. It’s fortunate that their death-defying efforts to master a difficult environment are finally getting some much-deserved respect. All photos by Joan Vos MacDonald.